I have difficulty taking pictures, especially with my phone. I have tremors, and the harder I try to hold still, the more I tremble, and the blurrier the photo. So I take about 47 pictures for every one that looks fairly decent. Unfortunately, my son's patience lasts about 35 pictures. Then I get "The Look". 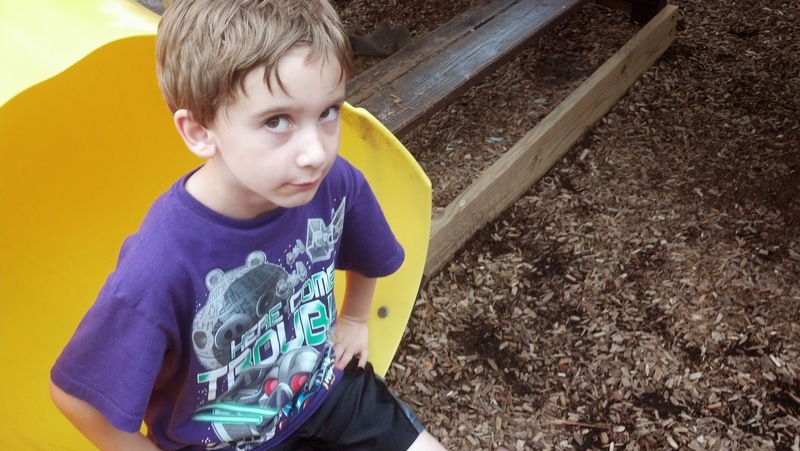 I can't be too upset with the boy over this expression, because he got it from me. I think that I would spend a good chunk of my day with this expression on my face, if I were independently wealthy and didn't need gainful employment. And who could blame any child for getting this expression after having to sit through 47 attempts at a picture for his mother, just so she has something to blog about on November 1st? This look is but a taste of what the teen years will be like, I've heard. I may need professional help. Moooom! take the picture already. Lol. More like, "Moooom! You're taking too long and I've moved on." I like the bit about having to control "the look" in order to stay employed. I don't have a poker face, so I struggle to keep myself in check sometimes. I can't help that I have such an expressive face! Oh Tina! As soon as I saw that picture pop up, I thought HE LOOKS EXACTLY LIKE HIS MOMMA!!! He's got my attitude, that's for sure! I'm in for a ride when he turns 13, if not sooner. you are not going to believe this, but this morning at approx 8am I was typing a comment to you, telling you how much I LOVE your son's facial expression and what great blog material this is and guess what? There was a MAJOR internet/cable outage in our area and I was knocked offline until 5pm!!!!! You have one POWERFUL BLOG! lol!! Thank you! Sorry about the outage, though. It may be genetic. Thanks for reading! My son has mastered that look! He's only 5, so I can assume that it doesn't get better?? No, I'm afraid that it does not. Thank you for reading!